It is based on a lion cub or kitten. 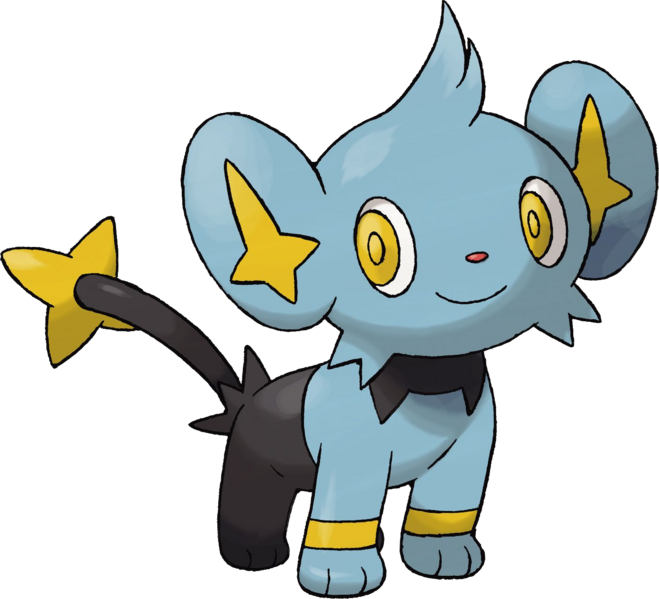 Its fur is mostly blue, yet there is a Pichu-like arrangement of black fur under its neck, and black fur under its torso. It has a long black tail with a gold four-pointed star on the end. Its forelegs each have a gold ring around them; these are electricity glands, similar to Pikachu's cheeks. It has large, oval ears with gold, star-like "fleur de lis" symbols on them. It has gold-pupiled eyes, and a pink-red nose. It has tufts of hair which will eventually grow into a mane; these can be seen on top and on the rear sides of its head. Whenever its mouth is shown open, small fangs can be seen developing.